The kidnapped Germans are two male team members of the Nok Culture Archaeological Research Project in Central Nigeria, professor Peter Breunig and student Johannes Behringer (which has been rendered as Johannes Buringer in some reports). Two female team members were not abducted. I’ve met Prof. Breunig and other members of the project and know that they are deeply committed to capacity-building in the local community as well as conducting research with local archaeologists, including the National Commission for Museums and Monuments (NCMM). The man with the seashell: Here, the terracotta figure is still in the ground and being recovered at the Pangwari site. (c) Peter Breunig, Johann Wolfgang Goethe-Universität Frankfurt am Main, n.d. While violent crime is a problem everywhere, it is obviously nonsense for Nigeria’s Police Force to ‘assur[e] all Nigerians and foreign nationals in the country of their safety’. Despite already increased security in the area [which appears to have been increased just days before this kidnapping, on the 22nd of February 2017, according to Police Commissioner Agyole Abeh], the kidnapping took place. According to Nigerian Federal Police Chief Ibrahim K. Idris (paraphrased by Vanguard) and Kaduna Police Command Assistant Superintendent Aliyu Usman (paraphrased by Deutsche Welle), the archaeologists ‘had [also] been assigned security personnel’ at the research centre ‘because of a spate of kidnappings in the area’; yet, on visiting the excavation site, they ‘had instead used local villagers as escorts’. Initially, I thought that the killed hunters had been security escorts, but other reports have shown that they were excavation workers. I also know that the team are careful. In the past, for example, they have suspended fieldwork due to security concerns. Breunig has worked in the country since 1989 and in the region since 2005. So, they will have made an informed assessment of the safest way to conduct themselves. According to local team member Sani Aliyu (as interviewed by Premium Times and syndicated by allAfrica), while the excavation team were working, five gunmen (first two with machetes, then three with ‘heavy guns’) came out of the bush or forest and ‘ordered them to lie [face] down…. and shot into the air in order to scare us‎’. Seemingly at that point, they also took the mobile phone of a local hunter and team member. Then, the gunmen ‘asked the professor and his associate to follow them and they led them to the other side of the road; made them cross the road to the other side from where we were and began to lead them further into the bush’. According to attempted rescuer Usman Kagarko (who was also interviewed by Premium Times), the kidnappers escaped on foot. When the excavation team were able to get up, one of the excavation workers (who was a local hunter) asked others to accompany him in pursuit of the kidnappers. Somewhat confusingly, Sani Aliyu stated both that ‘only one of us followed him and the two men’ went in pursuit and that ‘the two men and many other locals’ went in pursuit. Seemingly, according to local eyewitness and attempted rescuer Usman Kagarko, the two hunters were in front and many others were behind ‘on our motorcycles and on foot’. As Sani Aliyu narrated, when they realised that they were being followed, ‘they turned and opened fire’; Usman Kagarko said that they shot ‘sporadically’, which forced the rescue party to ‘scamper for [their] safety’. But Anas Ibrahim and Adamu Abdulrahim did not make it to safety. They were killed. Usman Kagarko explained that the local community ‘felt personally concerned that [these] very friendly foreigners’ had been ‘innocently abducted by criminals under [their] nose[s]’. He believed that, ‘[i]f only’ they had been ‘armed or in company of armed security’, they would have been able to stop the kidnappers. The airport road is exceptionally vulnerable to crime and violence. Since December 2016, there has been a resurgence of conflict over land rights between ‘Muslim, largely Hausa-speaking Fulani cattle drivers[/herders] and mainly Christian farmers’, which has killed at least 200 and possibly 800. Some kidnappers have created fake security checkpoints, then kidnapped those who have stopped. For instance, the Defence Attaché of Sierra Leone to Nigeria, Alfred Nelson-Williams, was kidnapped on the 1st of July 2016 (for a desired ransom of NGN 40,000,000 (around USD 126,183 or EUR 119,474) and released on the 5th of July 2016; Nigerian Army Colonel Samaila Inusa was kidnapped and killed on the 27th of March 2016 (though, it must be noted, he was not kidnapped for ransom). Kidnapping had already established itself as a way of extracting ransom from expatriate workers and wealthy locals in the oil-producing regions of the south. Partly since the “implosion” of the nationwide ‘oil-dependent economy’, partly since a ‘military crackdown on the theft of herds’ of cattle, kidnapping has established itself in the north, where ‘criminal gangs made up of suspected former cattle rustlers[/thieves]’ have thus been ‘pushed into kidnapping’. Hundreds of people are kidnapped every year. Presumably, the archaeologists were not targeted because of previous, completely false accusations that they were ‘mainly responsible’ (or indeed in any way involved) in ‘illicit digging’ of antiquities that were worth millions of dollars every year. However, this incident can only highlight just how irresponsible such baseless allegations were. According to a researcher for the International Crisis Group (ICG), Nnamdi Obasi, deep ‘poverty had [already] made “anybody, just anybody” a target’. Now, the practice has also broadened from planned, targeted abductions to spontaneous, “express kidnappings”, which are less often violently conducted and more often peacefully resolved. (As well as the plunder and pillage of imperialist and colonialist forces…) Nigeria has suffered intensive and extensive looting and smuggling since the famine of the Nigerian Civil War (or Nigerian-Biafran War) of 1967-1970 and subsequent droughts and floods. The illicit trade in antiquities is sometimes organised crime or even state crime, much like the illicit trade in oil. Unsurprisingly, amidst such poverty and insecurity, long-established subsistence digging and criminal looting have persisted, too. As Goethe University Frankfurt has observed, looters ‘are scarcely affected by the political unrest, and are continuing their business as usual‘. 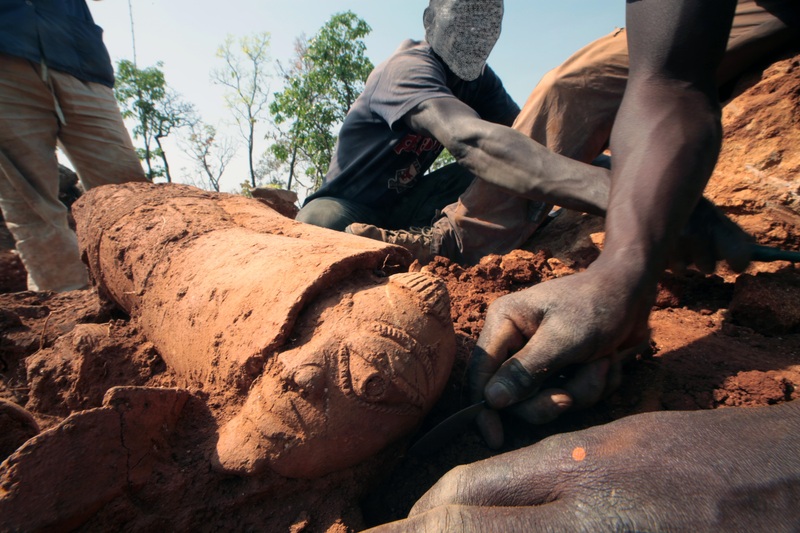 Hence, Nok terracottas and other endangered cultural goods are highlighted on the International Council of Museums’ (ICOM) Red List of West African Cultural Objects at Risk. On Thursday, the kidnappers contacted a local site supervisor or manager and demanded NGN 60,000,000 (around USD 189,274 or EUR 179,153). Evidently, a more junior local team member overheard the phone call in which the ransom demand was made, then shared the news with the media. An anonymous local source ‘warned’ the local site manager ‘not to involve the police or any security operatives’. According to the chairman of the Kagarko local government area, Shehu Musa Tafa, the threat concluded that, otherwise, they would ‘kill the German archaeologists’. Police and villagers are conducting a manhunt. As detailed by Vanguard, the police have engaged the Special Police Forces’ Intelligence Response Team (IRT), Technical Intelligence Unit (TIU), Anti-Kidnapping Unit, Counter-Terrorism Unit (CTU), Police Mobile Force and Police Surveillance Helicopters, as well as, the Department of Operations’ “Special Investigation Team on Kidnapping and Terrorism Cases. This latest kidnapping event is part of the ongoing security problem in Nigeria. This is mostly fueled by the social and economic displacement of a large number of the young people many of whom are unemployed. Many parts of Northern Nigeria have also been infiltrated by trans-border militants fingered in kidnappings, robberies and sundry criminal activities. At the 8th World Archaeological Congress held in Kyoto, the Archaeological Association of Nigeria (AAN) representatives sponsored a resolution on the incessant violence by Boko Haram and other Armed Groups in Nigeria, Niger, Cameroon and Chad. The Resolution highlighted the fact that ‘the violence had made archaeological work difficult and dangerous in many parts of these countries’. This latest incident underscores the fears expressed in the resolution and the need for the Nigerian Government to secure the country against armed criminal gangs. While we praise the recent efforts of the Federal Government of Nigeria in degrading Boko Haram’s criminal activities in northeast Nigeria, we urge the government to take more urgent steps in addressing the fundamental conditions in which criminal behavior and insecurity thrive.